Radish is an annual or biennial plant; the fleshy root, coming in various colors and shapes, produces an erect, hollow stem from 8 inches to 3 feet high. The alternate leaves are lyrately divided, with a large terminal segment. They may be glabrous or covered with sharp hairs. The white or lilac-colored flowers have violet veins and grow in branched racemes. Flowering time depends on the manner of cultivation. Widely cultivated as a salad vegetable. The juice pressed from grated, fresh radish root is an old European home remedy for coughs, rheumatism, and gall bladder problems. Radish has been used for chronic bronchitis, flatulence, diarrhea, headache, and insomnia. Radish is not recommended for use when the stomach or intestines are inflamed. The seeds treat abdominal fullness, sour eructations, diarrhea caused by food congestion, phlegm with productive cough and wheezing. Finely grated radish, sprinkled with raw cane sugar in order to make a syrup, provides good remedy for whooping cough. This will also help all liver ailments. 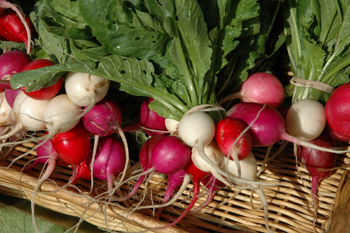 Radishes which have not developed flower stems are preferred. Juice: mix equal parts radish juice and honey. Take 1 tbsp. 3 times a day. Juice Cure: start by taking 3 to 4 oz. juice (by weight) before breakfast each day. Gradually increase the amount to 14 oz. a day. Depending on results, after 1 to 3 weeks, reduce the quantity to 3 or 4 oz. again until a complete cure is affected. Radish is not recommended for use when the stomach or intestines are inflamed.